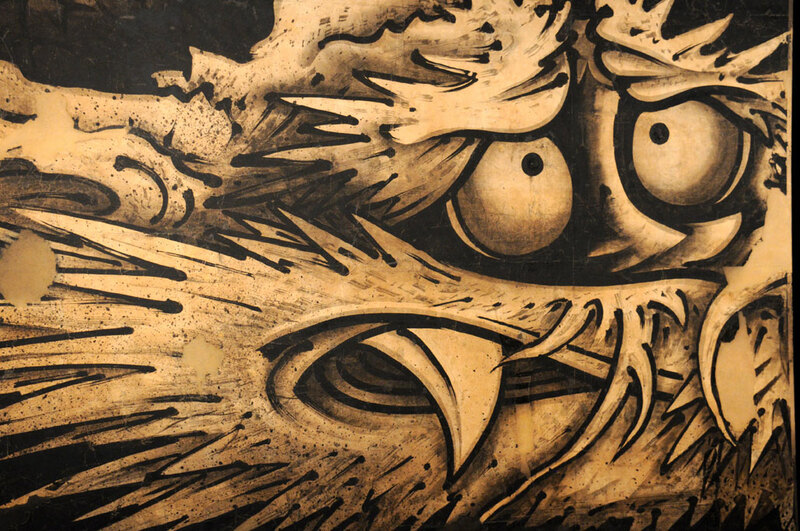 The Dragon and Clouds (1763), by the eccentric Japanese artist Soga Shohaku (1730-1781), has returned to the Museum of Fine Arts after touring Japan as part of an exhibition of Japanese masterpieces. The 35-foot-long work depicts a dragon swooping down through whirls of clouds and swishing its scaly tail in rich shades of ink. 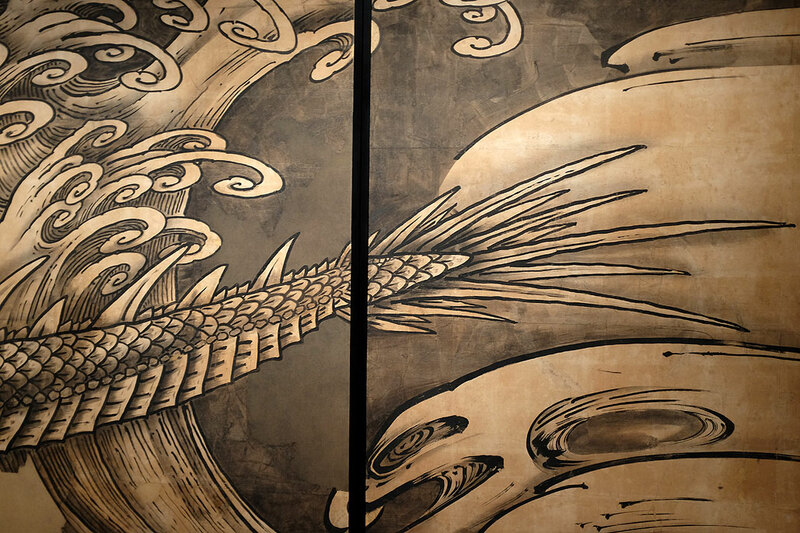 The work, comprised of eight paintings on sliding doors (fusuma), underwent a major conservation treatment spanning five years and involving five conservators. Anne Nishimura Morse, William and Helen Pounds Senior Curator of Japanese Art at the MFA, was kind enough to give RainyDayMagazine a tour last week of the exhibit. Besides telling us about Soga Shohaku’s “colorful” background as an artist, Ms. Morse also went into detail about the restoration and conservation process that brought this treasure back to life. Apparently, Soga Shohaku was quite the character! He basically made up his own back-story, his training, and art school lineage. As Shohaku had the skills to back up his claims (and lived in a time before Google Search), he was able to get away with it. The “legend” is that he painted while drunk, but looking at the work it is pretty hard to believe that the drunkeness wasn’t an act in order to bolster his mystique. Clearly Shohaku understood the value of PR!!! Note the exaggerated red signature stamp or “chop” at the right corner. Normally made using a carved block of stone, Shohaku actually painted that stamp and added details to suggest that the “stamp” was made by a block which had been used repeatedly. We are not sure if this was the artist being playful/mischievous, or some kind of commentary. Originally these panels were installed as sliding doors between rooms. During the restoration process, the paper from each panel was meticulously separated from the frame, patched as appropriate, and remounted on new lattice-work. To restore Dragon and Clouds, MFA conservators first separated and repaired the damaged paintings—minimizing soiling and discoloration as well as removing disfiguring repairs—then built custom wooden lattice cores with multiple layers of handmade Japanese paper on each side of the fusuma. We learned from Ms Nishimura Morse that one of the tenets of current conservation practice is that all “repairs” must be reversible. 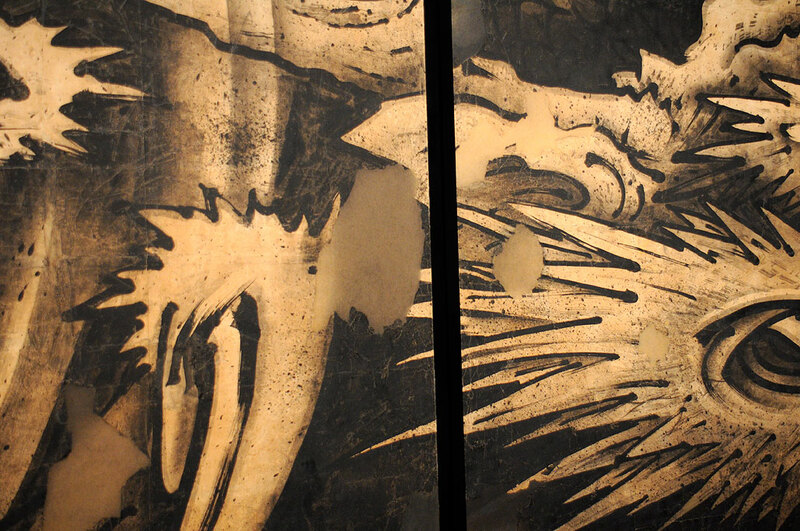 If newer techniques are developed or additional information about the work is unearthed, existing repairs must be able to be removed without damaging the artwork. This has not always been the case, and many times when a piece undergoes conservation it is mostly to remove earlier, damaging repair work. Note the gray circular shapes where the original door-grab would have been. When viewed closely, it is possible to see where the conservators did the patching and repairing. For some panels, whole sections may be missing. One of those is the tail of the dragon. 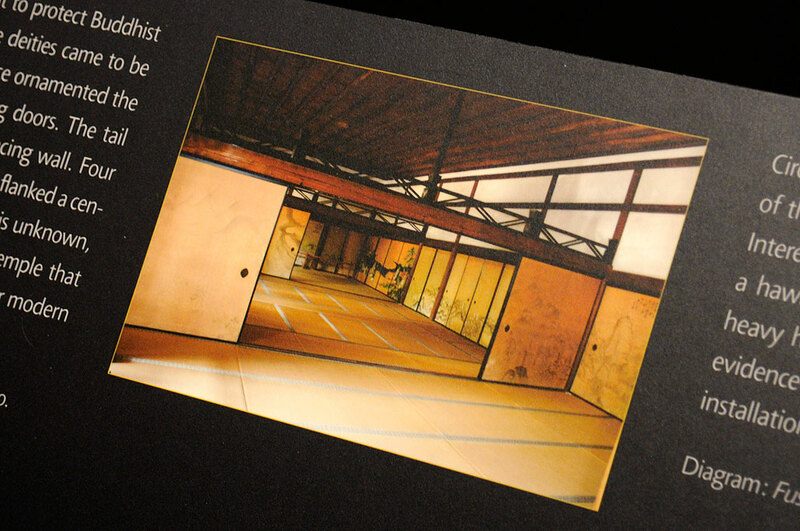 In the original installation as room dividers/sliding doors, there were paintings on both sides of the panels. When repairs were needed, edge panels with less art were often sacrificed. When repairing the Dragon, conservators discovered that the outer panels of this Hawk painting may have been used for some previous repairs. Those visiting the MFA will be able to see the remaining two panels on the opposite wall. 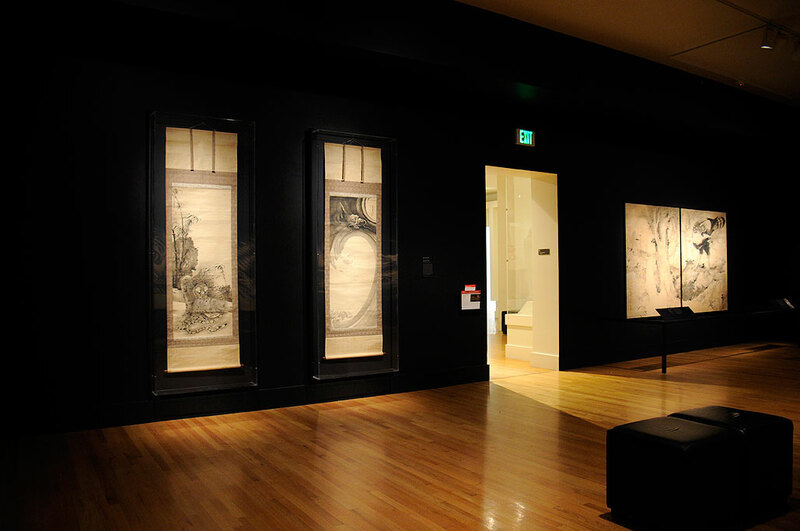 While the well-known Dragon and Clouds is the main attraction at this exhibit, the MFA has paired it with two other scrolls by Soga Shohaku: Dragon (late 1770s) and Tiger (late 1770s). His distinctively playful style were clearly evident in both works. These GIANT watercolors were done with just black ink. It is hard to convey the subtlety of the ink painting in photos. 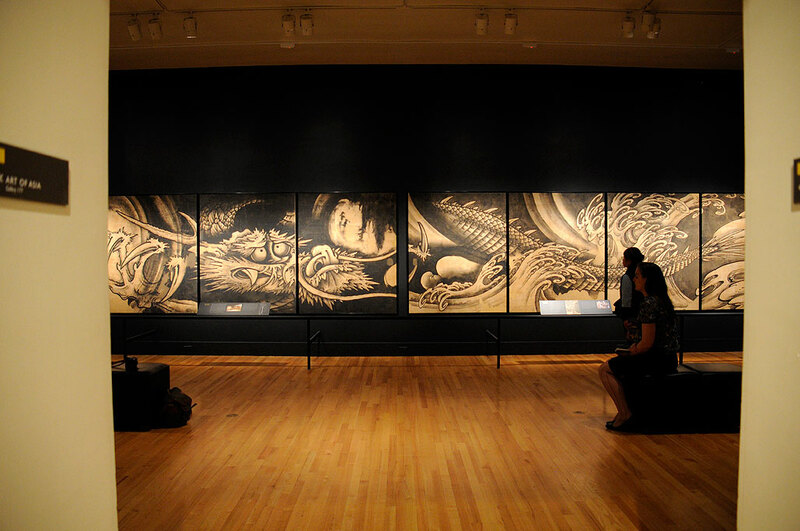 These panels will be on view until July 6th. Definitely check them out if you are able as they are absolutely stunning in person.